From a simple shower renovation project to a fully-integrated hydrotherapy shower, GROHE Rainshower® F-digital includes a multitude of showering solutions. 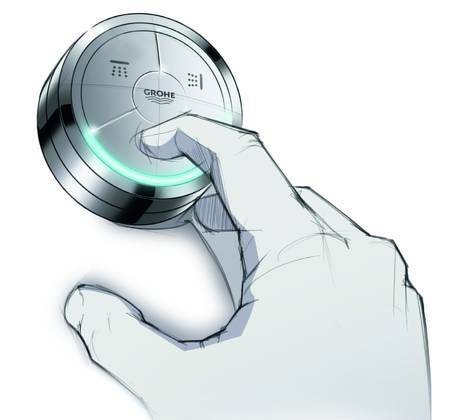 The wireless Digital Controller and Digital Diverter connect remotely to a thermostatic mixing unit, for accurate temperature control, greater showering comfort, and enhanced design freedom. Uniting simple operation with the latest wireless technology, the Digital Controller can be fixed in any position that is most convenient for you: on every position in your kitchen. Test the digital technology now! Based on a series of concentric rings, the design guides you to the point of interaction. And with just three buttons and a dial, using the controller is both intuitive and simple. The outer ring features textured detailing, ensuring maximum comfort and control of the water flow, even with wet or soapy hands. The light on the Digital Controller flashes when your pre-selected temperature is reached, so you’ll know exactly when your shower is ready. When you want to shampoo your hair or apply an exfoliating body scrub, just press the ‘Pause’ button and the system will memorise your current settings. Press the button again to restart the water at the exact same temperature and flow. Manage up to three shower outlets, e.g. 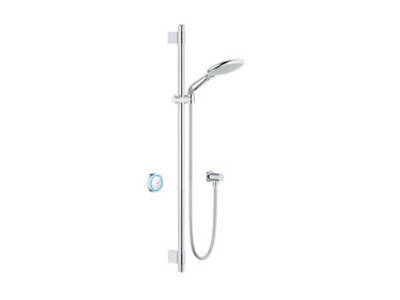 a head shower, a hand shower and a row of side showers, with a single Digital Diverter. The outlets can be selected separately or in parallel. Start your shower without getting wet. It is possible to add a second Digital Controller to your shower and place it outside the shower area. A safety lock is factory-set at 38°C to prevent the temperature from being accidentally being raised above this level. The limit can be adjusted, according to your needs. 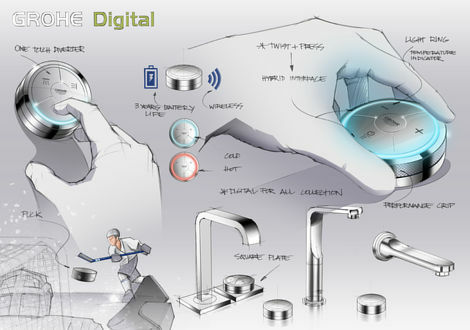 For your safety, comfort and enjoyment all GROHE Digital shower and bathtub fittings are connected to a digital thermostatic mixer. Featuring GROHE TurboStat® technology, the thermostat reacts instantly to any changes in the incoming hot and cold water supplies, to ensure the temperature you select remains constant for the duration of your shower. Find out more about our digital solutions for your bathroom or kitchen! 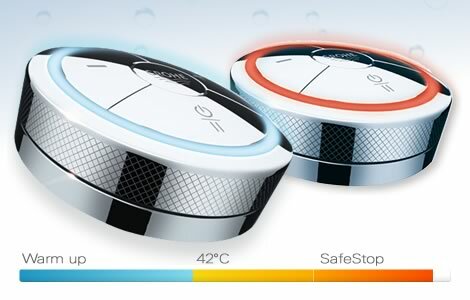 Do you want to touch and feel Rainshower F-digital for yourself?